There has been a great deal of recent media coverage both for and against the planned Trans Mountain pipeline expansion (TMX). Much of it is political, but of utmost importance are the ramifications for the planet. Prime Minister Justin Trudeau has stated that the expansion’s approval was based on science, and he is convinced of the project’s safety and necessity. But the pipeline is neither necessary nor safe for the people of Canada and for the planet. It is now well established that the use of fossil fuels is causing a climate crisis for the planet as a result of greenhouse gas emissions into the atmosphere. The effects on the safety, health and welfare of the public are well known—and are the worst for those in the countries that have contributed the least amount of greenhouse gases. That in itself is a social justice issue: wealthy industrialized countries, like Canada, have created the climate crisis that we all now face, but developing countries will be hardest hit by it. If Canada turns its back on the poorest nations, it will be a moral failure on our part. 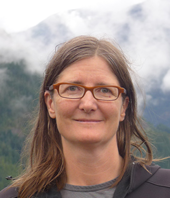 Professional engineers and geoscientists have a duty to protect public safety and the planet. Taken at face value, the above-mentioned codes of ethics mean that none of these professionals should engage in the design or construction of any new fossil fuel infrastructure. Rather, attention and effort should be put into developing renewable and sustainable energy resources. It is essential to understand that the problems caused by climate change will not stop with cessation of greenhouse gas emissions. What has been emitted up to the present will continue to cause additional global warming for decades and centuries; we can expect that even if there are zero further emissions, the temperature rise above pre-industrial times will be 1.4°C. 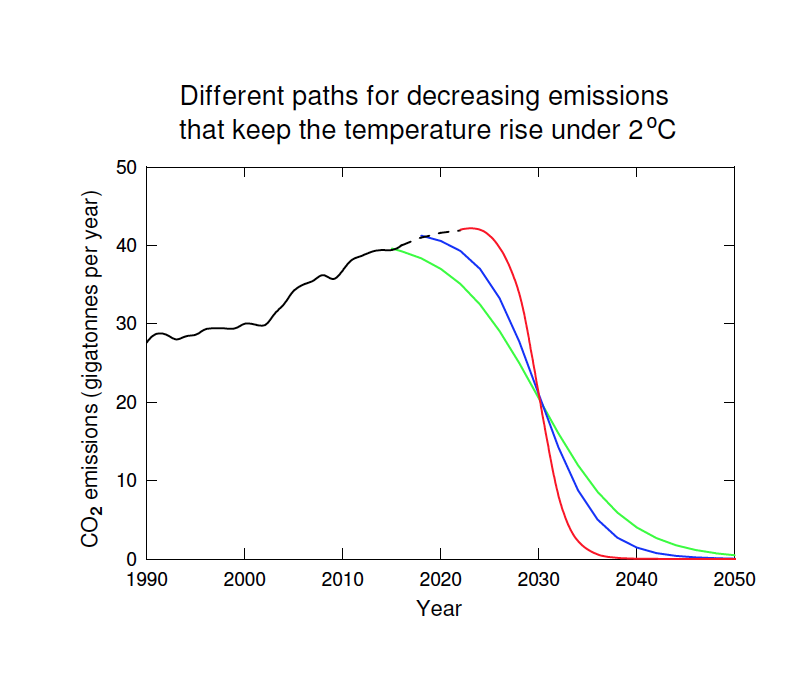 In order to limit the temperature rise to 2°C and avoid the most catastrophic consequences from climate change, it is necessary to reduce greenhouse gas emissions by 60% by 2030 (see figure below). Canada’s target is only a 30% decrease and there is no credible plan for even that. This is despite Canada’s commitment to the Paris Agreement to keep the temperature rise to under 2°C. We must stop throwing more fossil fuel onto the fire causing global warming. We need to treat this as an unprecedented emergency, a crime against humanity. Christina Figueres & five others. Three years to safeguard our climate. Nature, June 29, 2017. Figueres is vice-chair of the Global Covenant of Mayors for Climate and Energy, and Convenor of Mission 2020. Engineers always consider risks in their analyses. They do not design a bridge that has even a 1% probability of failing in its design lifetime. They should not be designing or building infrastructure that risks taking the planet into a runaway climate disaster. The science is clear. We need to start decreasing greenhouse gas emissions quickly and immediately. We could be transitioning to clean and renewable energy sources now, but there is a lack of support from federal and provincial governments. Prime Minister Trudeau has continued existing subsidies to the fossil fuel industry and is even promoting the oil sands industry. All this while other jurisdictions are on the cusp of phasing out fossil fuel usage. Entire nations, like Sweden, are making commitments to become fossil fuel free. We must stop throwing more fossil fuel onto the fire causing global warming. Where is Canada’s sustainable energy plan? Where is the federal government’s vision for the future? Where are our solar homes? Canada is rich in renewable energy sources including wind, geothermal and solar. We can make the switch to a clean and green future, and have a stronger economy and healthier society for it. We need the engineers and geoscientists to change course and lead the way by refusing to work on fossil fuel infrastructure, and, instead, innovate and design sustainable infrastructure. 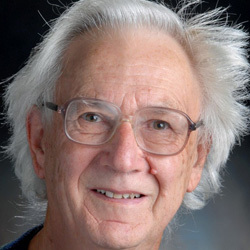 David Huntley is a professor emeritus in the Department of Physics at Simon Fraser University.